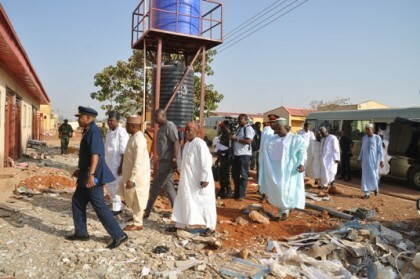 The House Committee on Defence recently paid an oversight function’s visit to the Armed Forces Command and Staff College (AFCSC) Jaji. The Chairman of the committee, Honorable Muktar Aliyu disclosed that the purpose of the visit was to assess the capital projects handled in 2015 and see where they can assist the College. In his remarks, the Commandant AFCSC Air Vice Marshal Suleiman Abubakar Dambo explained that the AFCSC is a tri- service institution formed in 1976 to offer an increased capacity of academics and professional training for officers and junior ranks. However, Since inception the College has helped in reducing the huge expenditure of sponsoring officers abroad. He further stated that the mission and objectives of the College is to produce operational low and middle level military officers of the highest professional standard as well as ensure standardization of Staff Duties in Nigerian Armed Forces. The Commandant added that the College is comparable to military institutions in other countries if not even better. He praised the federal government for their support in realizing this lofty dream of the College.